Ethiopia 2010: I heart Water. Over the last few weeks, we have had many training sessions with Dr. Berggren and Dr. Usatine in preparations for our Ethiopia medical trip. Walking out of each session, I have not only learned more about the history, culture, and needs in Ethiopia, but my heart for that country has only grown more and more with every story and every need. There is no debate that Ethiopia desperately lacks in healthcare, but one fact that I have been thinking about the most the past two months is the lack of clean, drinkable water in the country. Honestly, I have never really thought too much about water and the lack of it in my life - ever. Clean water is something that I always thought was available no matter where you were, and stories that indicated anything different was a vague concept that seemed somewhat unreal. But after seeing several pictures of women filling up water containers with brown, stagnant water and hearing stories about the fact that so many of their medical problems stem for this lack of a basic necessity humbled me in understanding this major issue that faces so many Ethiopians. Now, everytime I turn on a faucet, take a drink of water, brush my teeth, or do laundry, I think about how easy it is for us to do any of these things, but without clean water, none of these activities would be possible. I have only recently noticed how amazing it is to take a shower with hot, clean water. So many of us are so "rich," and we don't even know it. Without clean water, we, as first year medical students, will see countless cases of Trachoma, the leading cause of treatable blindness in developing countries. Without clean water, we will see children and adults with scabies because they can't wash their dirty clothes and sheets. And without clean water, we will see gastrointestinal diseases, malaria, and other infectious and water-related illnesses. Though these sessions, I'm sure, will continue to raise more reflection questions, I am sure I will not be able to comprehend the extent of the issues in Ethiopia unless we are there; and even then, those three weeks wouldn't be near enough time. 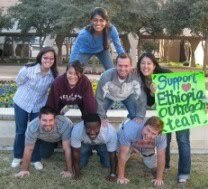 However, I am excited for our team and for the opportunity to make even a small difference in the lives of Ethiopians.